Solace® Prevention Series Mattresses are unique single and dual-layered foam mattress replacements that are designed to help minimize the risk of pressure ulcers by distributing the weight as uniformly as possible and allowing blood to flow through the capillaries in areas prone to lesion development. The Prevention Series offers four mattresses, each increasing in treatment efficacy as you move up the line. The unique and patented designs combine comfort and technology for patient and caregiver confidence. A zoned top layer relieves pressure in the important susceptible body zones, while the convoluted fortress cut foam offers more surface area for resident support and relief. Includes softer head and heel sections to help protect vulnerable areas. Helps distribute weight and lower interface pressure to help prevent pressure ulcers in low risk patients. 70 denier nylon cover guards against friction with non-skid bottom surface. Convolute foam helps circulate air around mattress user. 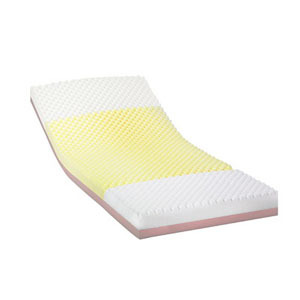 Two layer quality foam designed for preventing pressure ulcers.